I’ve tried to wrap my mind around the fanboys and geeks who spend hours recreating meticulous costumes and performing scenes from their favorite movies. I’ll admit I don’t get it. But I certainly appreciate when these guys go so far over the top that the cops have to be called in. That happened in the UK when two cousins, who were filming themselves acting out lightsaber fights in their backyard, were attacked and assaulted by a drunken Darth Vader. 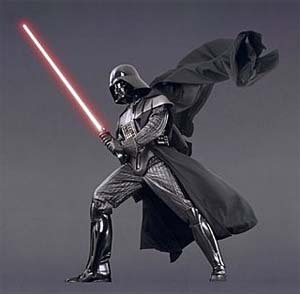 The young man kept screaming “Darth Vader” during the attack and used a black garbage bag and a cape to create his version of a Star Wars costume. Vader wacked the two cousins with a metal crutch instead of a glowing lightsaber. The Darth Vader wannabe is also apparently a fan of the grapes and had consumed the better part of a whole box of wine before leaping over the fence into the back yard and bashing the young men. During a court appearance, he admitted he didn’t even remember the attack until he read about it in the local paper and still isn’t sure where he got the crutch he wielded as a weapon. The BBC has the whole story which includes the judge using a “force” reference during the proceedings. Here are a few lightsaber videos to get you in the mood before you click the BBC story link above. First a mash up of Monty Python and Star Wars. Then a little Lego symphonic action. You’ve got to include some Yoda and the Star Wars kid. How about some stick figure action with a bit of a twist at the end. Let’s throw in the original trailer for Star Wars that made everyone want to go to the theaters in 1977.